Overall, these changes (and others) made an impressive improvements, such that the combined algorithm rivalled std::sort for sorting std::vectors of integer. However, the algorithm wasn’t as competitive for other important element types such as std::string. Dietmar intended the talk to be accessible to all, rather than an in-depth presentation using advanced C++ techniques. I think it was a good example of how you can iterate and bring in multiple techniques to optimise an algorithm for a specific use case. Terse Exception Messages by Chris Oldwood. Here, Chris relates his experience of unnecessarily long debugging sessions due to limited error information in exception messages. Often, this is due to laziness on the part of the programmer, sometimes because they expect to refactor a block of code soon and will come back to “do the error handling later” – then the refactoring never happens. I see this as a false economy – even during unit testing, having proper error messages in exceptions can speed up your own debugging. Get Debugging Better by Jonathan Wakely. Here, Jonathan lists a few tips for using GDB effectively, aimed at programmers like me who typically use an IDE. Catching up on back copies of ACCU’s CVU magazine, there was plenty of good material in January 2015’s edition. Standards Report – I was particularly taken by Mark Radford’s note on Operator Dot. At first sight, it could be dismissed as a typical C++ programmer’s wish to overload any operator available, which is currently prohibited for operator dot. However, Bjarne Stroustrup himself is named on the paper, and the motivating case is for ‘smart reference’ classes. Scott Meyers Interview – more than just a subtle book plug, gives an insight into Scott’s introduction to programming and C++. 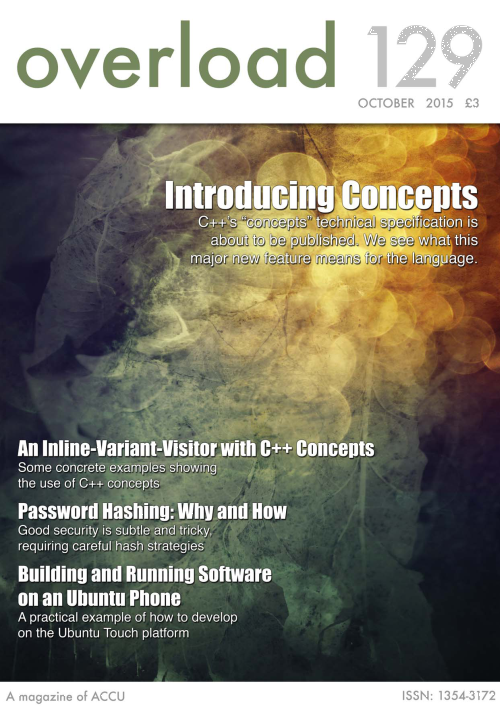 October 2015’s edition of Overload includes an excellent article by Andrew Sutton on Concepts for C++. I first heard about Concepts at the ACCU 2013 conference and it’s exciting to hear that they have reached Technical Specification stage. However, I wasn’t expecting the ability to use concepts for placeholders (so that, once you’ve defined a concept, you can use it where you might have used auto to gain the benefits of type deduction without the loss of information). Roger Orr wrote an excellent article for Overload about complexity measurement. It’s amazing how many candidate for programming roles in general, and C++ roles in particular, aren’t comfortable with order notation. This introduction should be a must read before interviewing!